Some people prefer faux wood blinds to other options for window treatments, including real wood blinds. If this is something that you are considering, or if you would like to know more about this option, the name to trust in is Sweet Shutters and Shades. We have a large selection of quality products and some of the best pricing for faux wood blinds in Charlotte. We take this industry seriously, and you will see that first hand from the moment we meet with you for your free in-home consultation. That's right, we provide you with an in-depth consultation and bring the samples to you. This gives you the ability to see the variety of choices that we offer, inside your home. What better place to see your window coverings options than to see them in place, on your own windows, inside your home? Our Charlotte window blind company offers flexibility in scheduling for your consultation, because we understand what a challenge it can be to work around your work schedule and busy life. We can schedule an appointment for any day of the week – morning, noon or night. Let us show you the variety of options that you have for window treatments and assist you in making the best choices possible. Obviously, faux wood is more cost-effective than the real thing. If you are on a budget and want the look of wood without the price tag to match, this is your best bet. If you are looking for an option for your window coverings that are resistant to moisture, this is the perfect choice. In fact, this is one area where the faux wood is better than the real thing. Use in rooms like the bathroom, where dampness and moisture tend to damage other styles of window treatments. Many homeowners prefer this material because it is eco-friendly. Opting for faux wood does not deplete existing resources, plus they are recyclable. 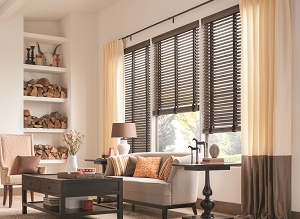 Feel good, and environmentally responsible, for selecting these blinds. The list continues, so give us the opportunity to tel you more about faux wood blinds in Charlotte, and your other choices, in person. We'll bring our mobile showroom to you! At Sweet Shutters and Shades, we look forward to working with you and providing you with the information that you need, to make the best decisions possible. With over 20 years of industry-related expertise, you can feel confident about the results we will deliver for you. Give us a call today to find out more about what we can do for you. If you would like an estimate for faux wood blinds in Charlotte, NC or the surrounding areas, please call Sweet Shutters and Shades at 704-980-4303 or complete our online request form.